In almost every workshop I do, whether with parents, childcare providers or teachers, the desire is expressed for the children in their life to cooperate. 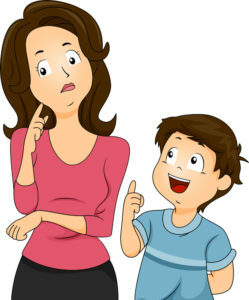 However, when adults refer to wanting children to cooperate, they often mean that they want the child to be compliant. But the meanings of cooperation and compliance are quite different. Compliance means obedience and submission. Cooperation means collaboration. If we break the word cooperation down, “co” means together and “operate” means to work. So the true meaning of cooperation implies working together or in partnership. Now I’m not saying that there aren’t times when we need children to follow through on our instructions, but what adults really need to be focusing on, for the most part, is true cooperation – which is really about working WITH a child and showing respect towards him or her. The word With is important here. When I refer to winning a child’s cooperation, I mean working with him or her or winning his or her desire to work with you. Express understanding for the child’s feelings. Be sure to check with him or her to see if you are right. Dr. Nelsen emphasizes that an attitude of friendliness, caring, and respect are essential to these steps. In my Discipline with Influence Online Parenting course, I devote a good chunk of time to giving parents information related to how they can problem solve WITH a child and thus invite cooperation from him or her. In almost every case when parents and other adults transition into a collaborative approach to problem solving WITH children they are amazed at how effective it is! Problem solving WITH the child is respectful to all involved and serves to help the child take ownership of the problem. One more way to discipline with influence!